After a three million-year hiatus, the prehistoric creatures that once roamed the Anza Borrego area of Southern California are back. Thanks to the vision of multimillionaire Dennis Avery, of Avery Labels heritage, and the metal sculptor, Ricardo Breceda, we can see these life-size sculptures of raptors, saber-tooth cats, gomphotheres and wooly mammoths related to the elephant and giant birds who once lived here before geological events changed the landscape. These giant metal portrayals exhibit amazing detail as you gaze into the eyes of a giant bird sitting atop its nest feeding babies, or admire the head of a 350 foot-long sea serpent that starts on one side of the road and emerges from the desert sands on the other side of the street. 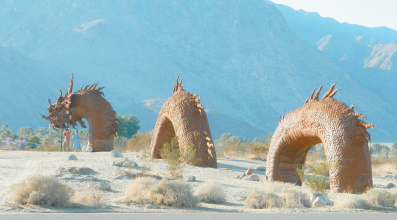 The sculptures, now numbering 131, dot three square miles of undeveloped property called Galleta Meadows, which is owned by Avery and located on the outskirts of Borrego Springs. He allows the public use of his property, which is enclosed by Anza Borrego State Park, located about 70 miles northeast of San Diego. “These works of art are made to be seen and touched,” pointed out Dennis Avery. You can drive up to the sculptures, as we did, or, for the more adventuresome, hike the trek through the metal animal kingdom. Paths have been worn from the road by admirers and curiosity seekers as they ventured out to get a closer look at the giant metal works of art. 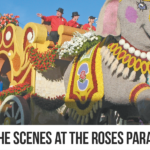 For the most part, the sculptures are made from 22-gauge rolled sheet-metal that is pounded into place. The structures start with a framework of iron bars to which Breceda welds metal plates that have been hammered into life-like parts. The tedious work requires various-sized hammers to pound texture into patches of metal that are turned into animals. He uses other types of metal for detail. Shredded steel and wire are welded to a bucking bronco’s neck to resemble a stiff mane and to the backside for an engorged tail caught in mid-flight. A giant piece of metal art usually takes Breceda and his staff up to six weeks to finish at their shop in Perris, California, about 75 miles away, where most of his creations are completed. However, it took him four months to build the giant sea serpent in the shop and another three months to erect it onsite with the help of 12 assistants. During our visit, we were lucky enough to meet the artist as he was delivering his latest creation and stopped to chat with us about his work. The metal menagerie started as an interesting science project for school kids and evolved into a book of the animals that once roamed here, recalled Avery. “We decided to go three-dimensional and needed an artist,” he added. Avery first discovered Breceda’s work while driving down the freeway where he spotted a 30 foot-tall tyrannosaurus rex peeking above a chain-link fence. Shortly thereafter, the two men brainstormed the project, and the first sculptures were displayed in the desert in 2008. 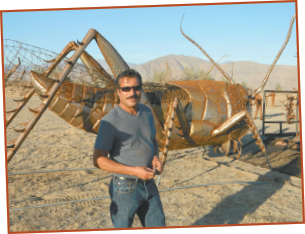 ​Ricardo Breceda stands next to his “grasshopper” sculpture. Another giant sculpture appears on the cover of this issue! Breceda’s passion for metal sculptures started when the former construction worker was recuperating from a fall off a two-story building that left him with a broken back. That was 17 years ago. Sparked by his daughter’s interest in dinosaurs and the release of Jurassic Park III in 2001, he started creating his metal animal kingdom. The self-taught artist was first commissioned by Avery to craft animals based on the book, Fossil Treasures of the Anza-Borrego Desert. The dinosaurs began to appear in 2008 with a family of gomphotheres, the largest of which was 12 feet tall and 20 feet long. Lately Breceda has expanded his artistic work to include scenes from California history with prospectors, Indians and farm workers. While the beauty of wildflowers will come and go, you can count on these magnificent works of art to be there for a lifetime. “The older they get, the better they will look,” said Breceda of nature’s impact on the metal works of art. The work continues, and who knows how many of these sculptures will sprout out of the desert in the years to come. 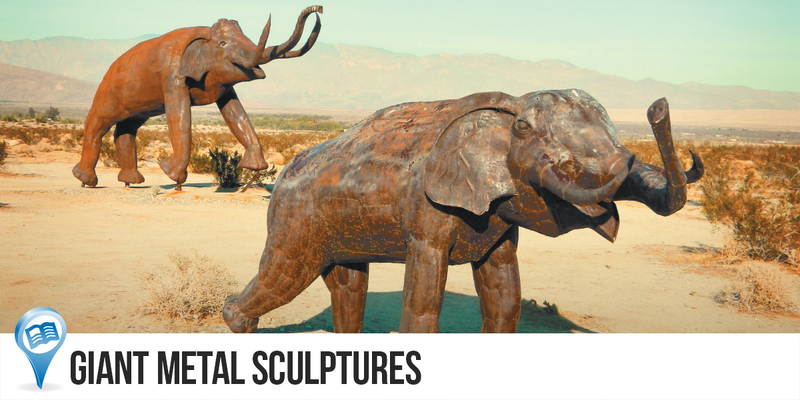 Stop by the local visitors center to pick up a map of where you can find the sculptures, or just drive around Borrego Springs Road, and you’ll be sure to find these amazing works of art. You can also get more information and maps at www.galletameadows.com. You will find this area to be RV-friendly to boondockers. On the way to Borrego Springs, you’ll see many RV enthusiasts who have set up camp to enjoy the many pleasures the desert provides. Escapees discount parks in the area: Anza RV Resort (anzarvresort.com, 951-763-4819) and The Springs at Borrego (springsatborrego.com, 866-330-0003) Other RV parks: www.anzaborrego.statepark.org, www.palmcanyonresort.com and www.pinezanita.com. Doug Imberi is a retired public affairs manager for the Department of Defense who lives in Northern California when he isn’t traveling about in a 30-foot fifth-wheel with his wife and two mini doxies. 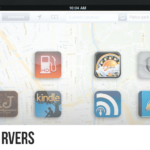 Doug is also an award-winning homebrewer and has had several articles published in RV magazines.